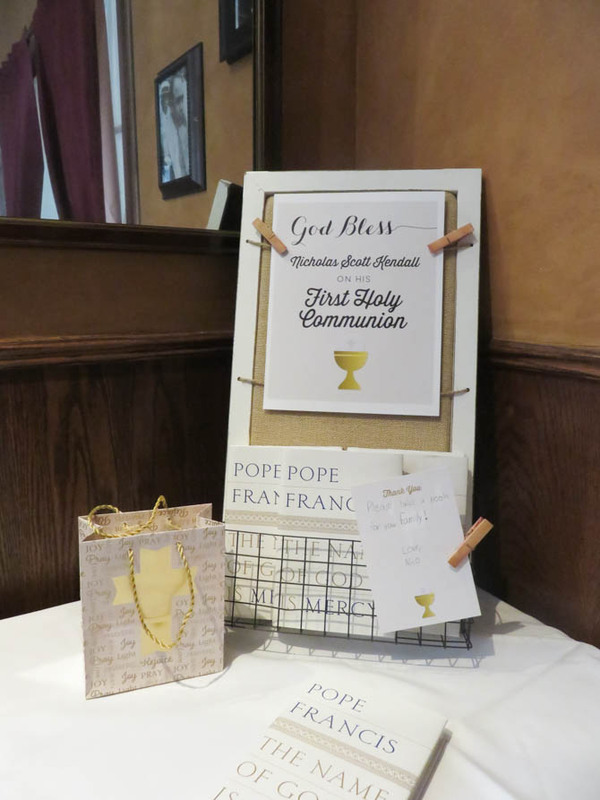 Guess who received the�sacrament of First Holy Communion this weekend? Nico!! Yay!! We were all very excited for him, but no one was more excited than Nico. Being the little brother to someone as competitive and active as Mikey means you do a lot of following around and supporting. 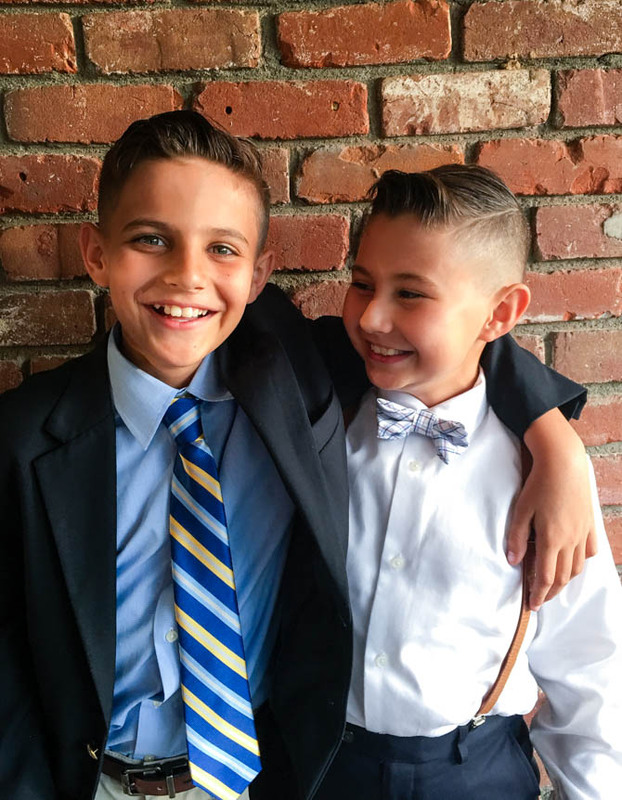 Swim, karate, academic decathlon, science fair, band performances: all activities where Mikey has been front and center, or at least an equal participant with Nico. May 7, 2016, however, was all Nico. He felt like a rockstar and loved every minute of it. I thought he looked a bit like Tommy Shelby in Peaky Blinders, especially at the restaurant we went to for dinner. I used Meyer Market Designs for the�invites and poster. 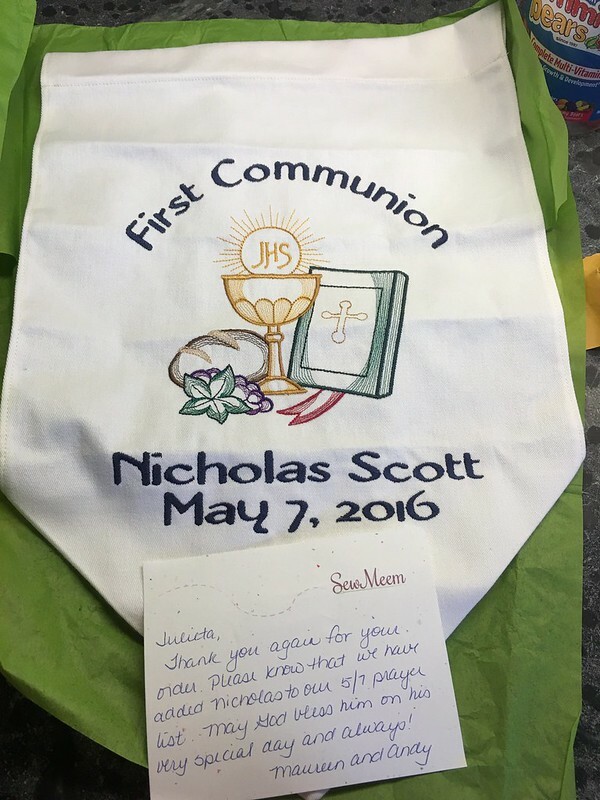 Basically, Nico’s First Holy Communion was brought to us�by Etsy. 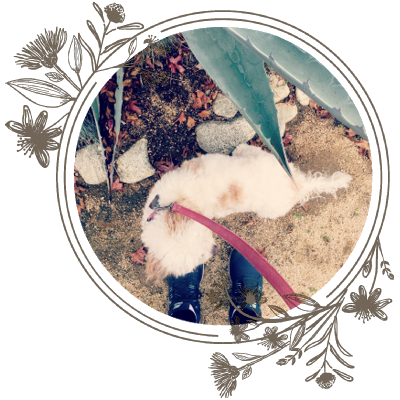 �The only thing I didn’t use Etsy for was the favors. 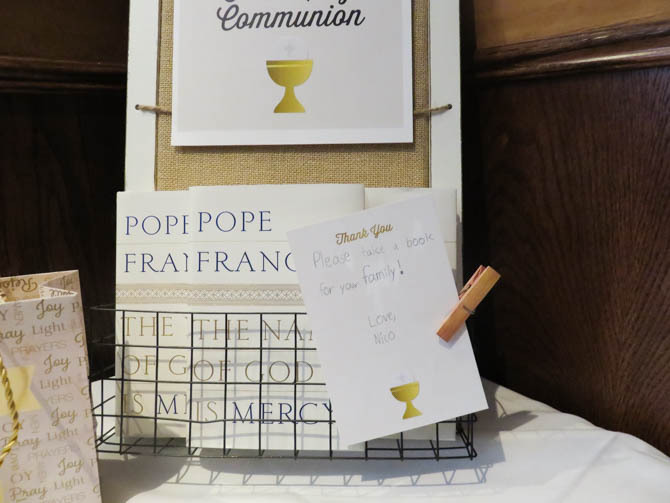 We gave each family a copy of The Name of God is Mercy, by Pope Francis�because we’re agenda pushers. Let’s talk about that banner, which I love to pieces. Mikey’s banner was a traditional kit banner�(I just read that post. I’m a dork, and Mikey’s chalice was the definition of elegance�compared to Nico’s Liberace inspired work of art.). We still have it hanging in his room, but much of the felt has come off over the years. This time around, I wanted something I could keep forever. 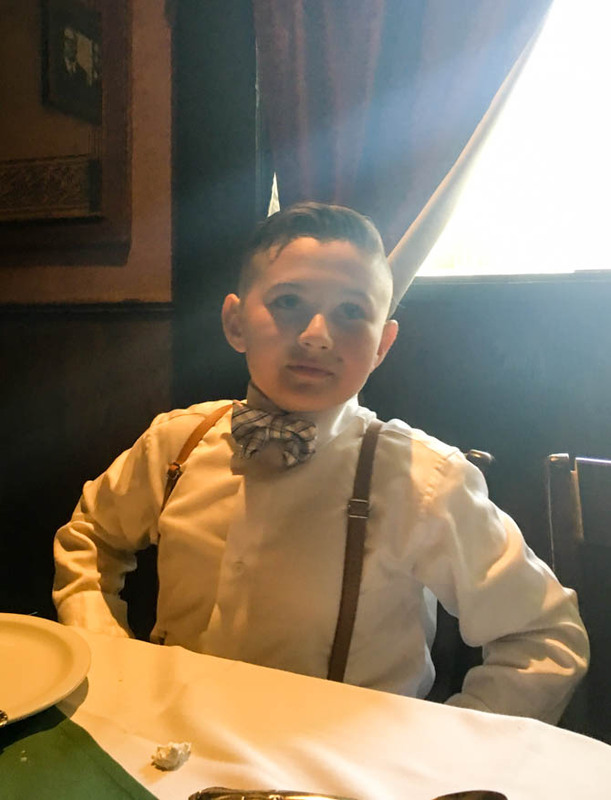 I pictured something I could hang�on the wall alongside the First Holy Communion picture from the photographer at the school. I searched Etsy and found SewMeem. I can’t recommend the company enough. I’m even debating buying another banner for Mikey since his felt one is a tattered mess. The banner does not come with the rod, finials, or cording. We added that ourselves. 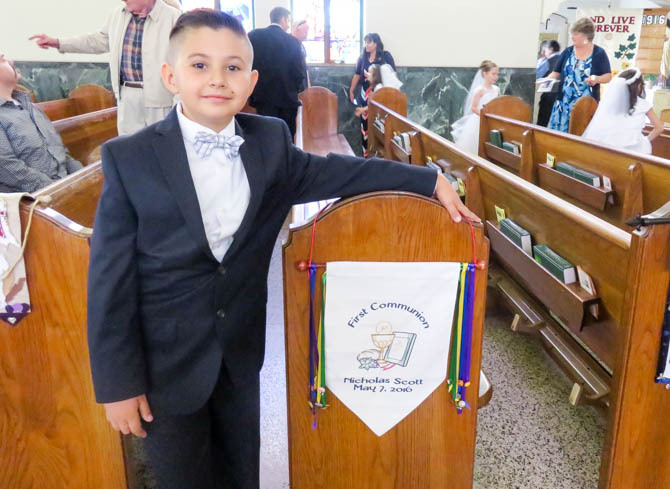 When I told Nico a rainbow outfit wasn’t going to work for his First Holy Communion, I promised him that I would incorporate them in another way. Nico loves rainbows because when God saved the animals after the flood, he sent a rainbow as a symbol of his covenant with Noah. Saving animals is important to Nico. 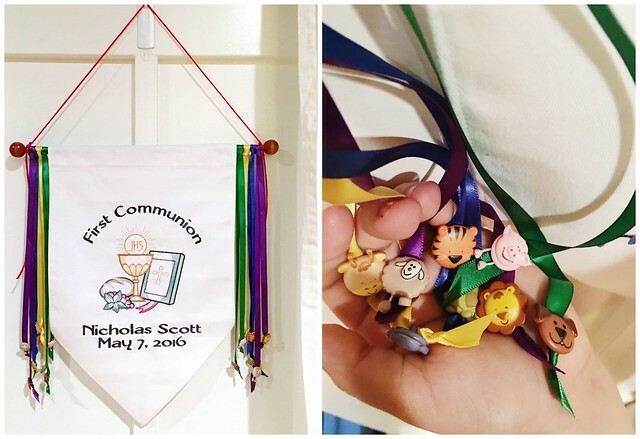 So I gave his First Holy Communion banner rainbow streamers and attached $30 in animal buttons. 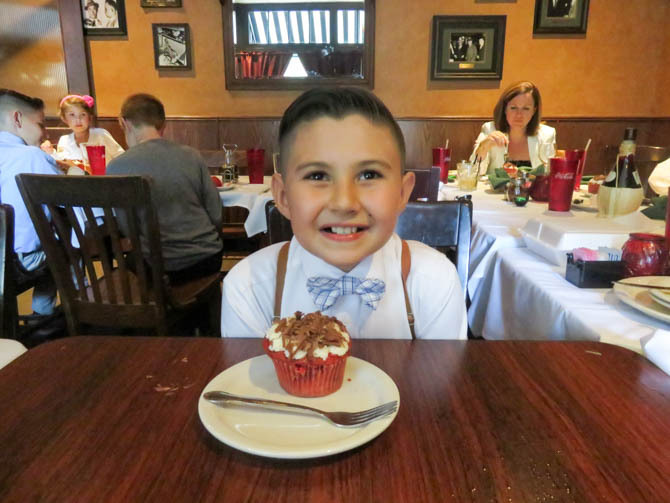 Nico was over the moon.�He picked the placement and ribbons for each animal. 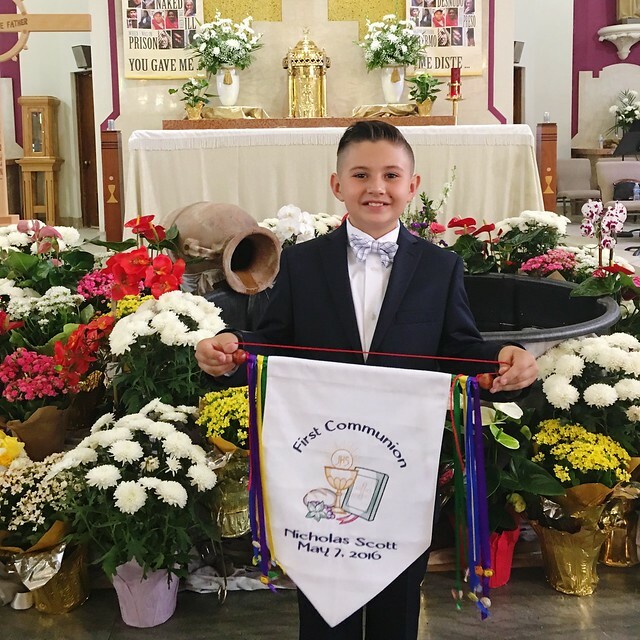 It was very important to him that the “Lamb of God” and The Lion were together on the purple ribbons (because it’s the liturgical color of Advent and Lent, mom). He loved it so much that I have very few pictures of him with the banner where it is in focus. He liked to swing it back and forth. In church. Buttons flying. Like my temper! 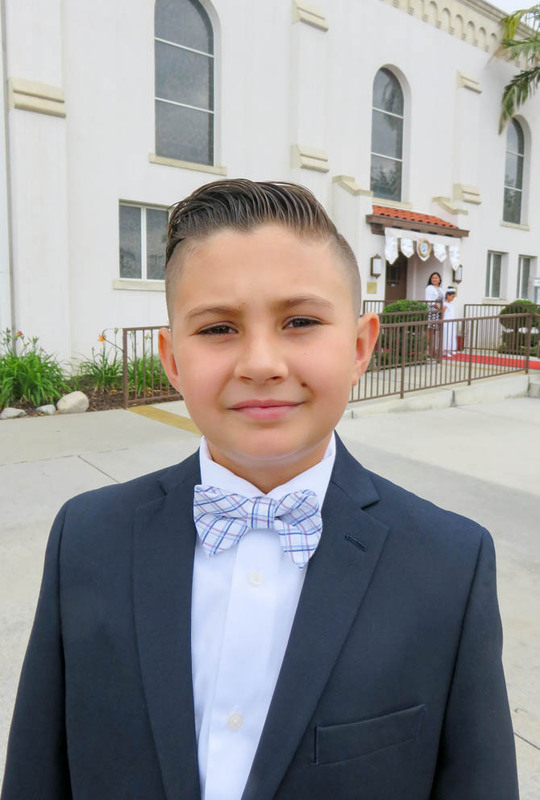 All in all, it was a great day.�Congratulations, little man. 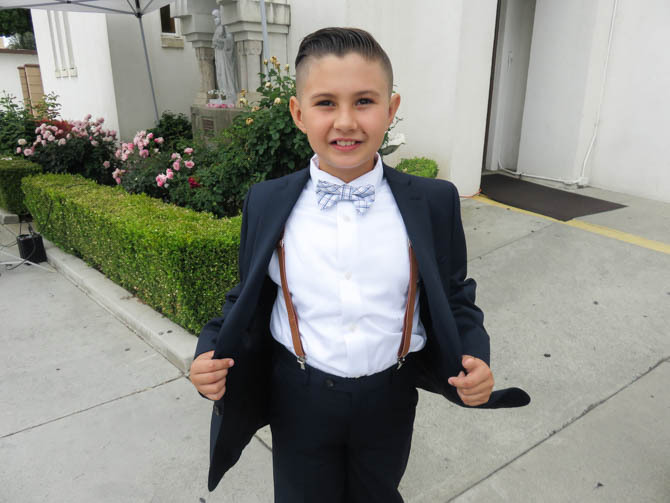 He looks so dapper! Congrats on his special day. Love this so much in every way. 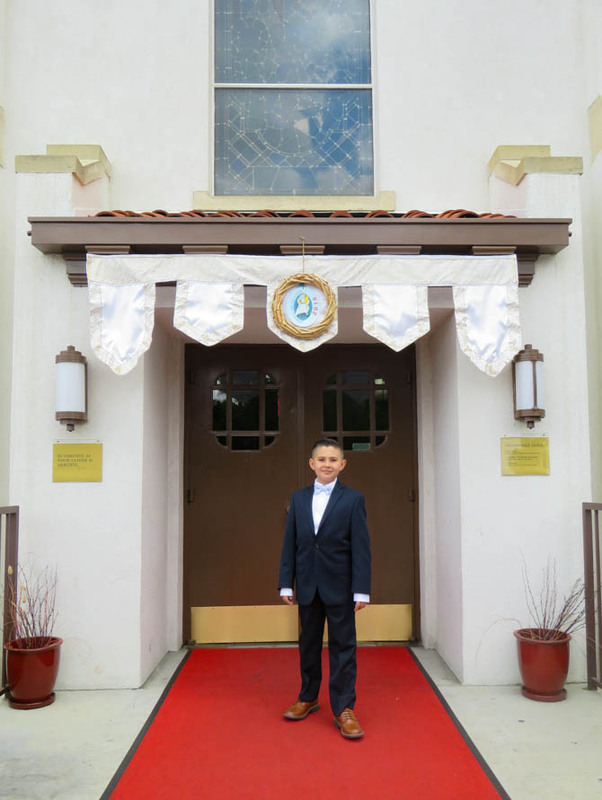 The photos warm my heart and show his personality was incorporated so well into outfit and banner. Great job ! What a wonderful way to celebrate his new relationship with Christ. Innocence and goodness and Blessings indeed! I think the quilt is such a neat idea! It’s also a very optimistic idea. That would never work here. People move a ton around here just between schools, let alone neighborhoods and cities. Sigh. 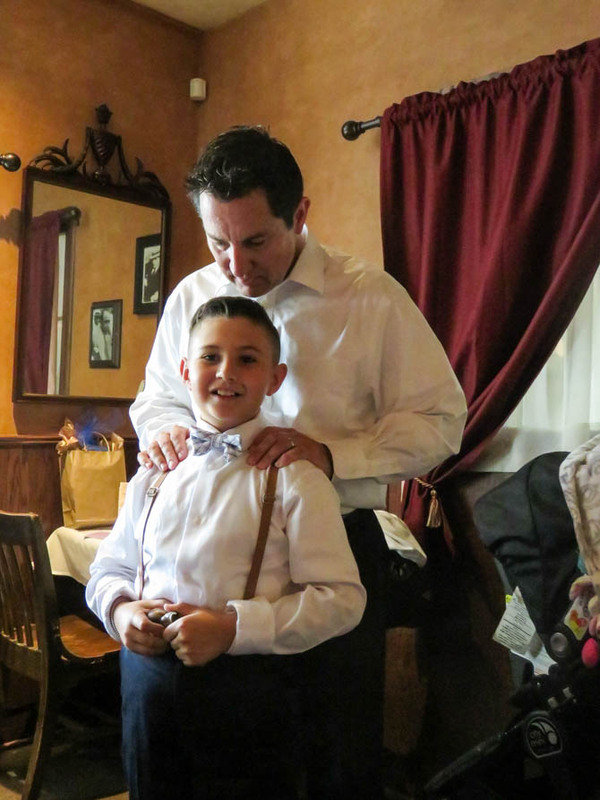 I love the posts you do about your sons, because there is so much love there. What a gift they have in you. Happy Mother’s Day and congratulations Nico. Congrats to Nico! Those buttons, ribbons, everything is adorable! Since I am not Catholic, could you please explain the significance of this event for Nico? Is it like a coming-of-age ceremony? Congratulations Nico! May the Lord continue to bless him and your family. I love reading all your stories. 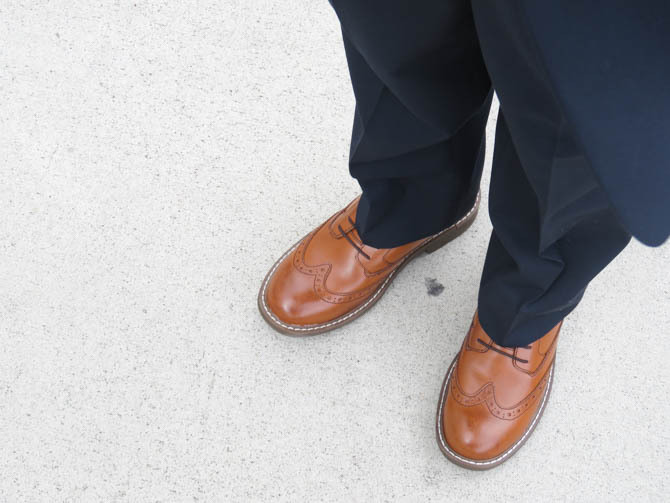 Thanks for creating such a great blog. I am always excited when I see a new post in my rss reader. So, so sweet! Thanks for sharing all the details. I love it! I’m not Catholic but I loved reading every bit of this post! Such love. Congratulations to all.